If it weren’t for a visit to Memorial’s Be Aware Women’s Fair, Barbi Walter is convinced she wouldn’t be alive today. The owner of Barbi’s Styling Studio in Sherman, Barbi and her preteen daughter, Molly, visited the fair in October 2011 in the Orr Building on the Illinois State Fairgrounds. She decided to give blood at the Central Illinois Community Blood Center, which was stationed at the fair, to teach her daughter the importance of giving back to the community. A worker told her they couldn’t accept her blood. She was “severely anemic” and was urged to follow up with her doctor as soon as possible. The following Monday at her doctor’s office, her iron level was even lower. Her doctor thought it might be a bleeding ulcer or something else that wasn’t too serious. To be safe, he wanted her to follow up with a hematologist, who scheduled a colonoscopy. That led to a CT scan. A mother of three and grandmother of two, Barbi learned she had ovarian cancer, which had already spread to her colon, lymph nodes and the fatty tissue around her abdomen. After three rounds of chemotherapy over two months in early 2012, the cancer hadn’t shrunk; it had grown. The four-hour surgery was aggressive, but so far the results have been excellent. Her colon, reproductive organs and fatty tissue around her abdomen were removed. She spent four days in the hospital, and another seven weeks at home to recover. That was followed by three more rounds of chemo. 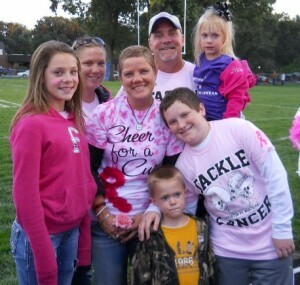 Barbi has since had two CT scans, and there’s been no sign that the cancer is returning. Ovarian cancer is the fifth leading cause of cancer-related deaths in women from 35 to 74 years old, according to the American Cancer Society. If diagnosed and treated in its early stages, the survival rate is more than 90 percent. However, ovarian cancer’s symptoms aren’t specific and often mimic those of other more common diseases, according to the Mayo Clinic. And this makes early detection difficult. Barbi had back pain and stomach bloating, but didn’t suspect they were warning signs. Because she works on her feet all day, her lower back pain didn’t seem unusual. She encourages women to listen to their bodies and not dismiss the warning signs. Let your doctor know about them and take advantage of free screenings, such as the ones offered at the Be Aware Women’s Fair.